Solve over 175 Jewel Quest® Heritage boards and one puzzling family mystery on a topsy-turvy quest through Europe´s ancient hot spots. Hit the trail with Rupert on a journey through the shrines and castles of Hernan Cortes´ lore. 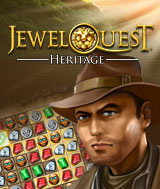 Swap jewels and collect puzzle pieces to unravel a perplexing web of Jewel Quest® family history. With over 175 new Jewel Quest® Heritage boards, including 3 jewel-swapping modes, new surprises await in every level. Comments: I especially liked "Jewel Quest Heritage" because It fills you in on some of the background I have been missing. It is more fun to follow the stories when you know why a character behaves in a certain way. If you are into the story behind the quest this is your game.